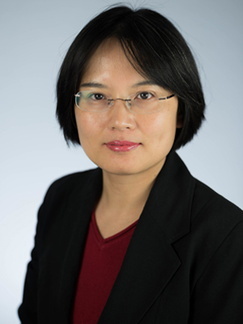 Dr. Liang's research focuses on understanding the molecular mechanisms of viral replication and pathogenesis, and utilizing this knowledge to develop novel preventative and treatment measures for viral diseases in humans and animals. Her current research projects involve two RNA viral pathogens, Lassa fever virus and influenza virus, the former causing highly virulent hemorrhagic fever disease in humans and the latter remaining a global threat to human and agricultural animal health. Studies from Dr. Liang's laboratory have revealed novel mechanisms by which these viruses interact with host innate immune systems and cell signaling networks to promote viral replication and cause virulent infections in hosts. In addition, they utilize the knowledge and molecular tools of arenaviruses to develop a novel, safe, and effective viral vaccine platform, with which they will develop effective vaccines against various pathogens including diverse arenavirus pathogens and frequently evolving influenza virus. Finally, Dr. Liang's lab is interested in studying the roles of host factors and signaling pathways in the influenza viral replication and disease pathogenesis in the lungs with an ultimate goal of developing novel antiviral therapeutics against influenza viral infection. My research focuses on the host-pathogen interactions of two RNA viral pathogens, arenaviruses and influenza virus, and the development of novel preventative and treatment measures. (1) Arenaviruses such as Lassa fever virus can cause hemorrhagic fevers in humans with limited prophylactic and therapeutic treatments. We are interested in studying the replicative and pathogenic mechanisms of arenaviruses with a particular emphasis placed on the virus-host interactions during viral infections. (2) Current vaccine programs and existing antivirals are unable to provide complete preventative or therapeutic effects due to the constantly evolving nature of influenza virus. We study the roles of host factors and signaling pathways in the influenza viral replication and disease pathogenesis in the lungs. (3) We are developing a novel live viral vector based on a trisegmented Pichinde virus to generate multivalent and cross-reactive vaccines against various human and animal diseases.